he 3d technology came and opened our eyes for another world, the world of enhanced depth perception. It is great for watching videos but is also particularly effective when playing a game as it makes the visual experience more realistic than ever. 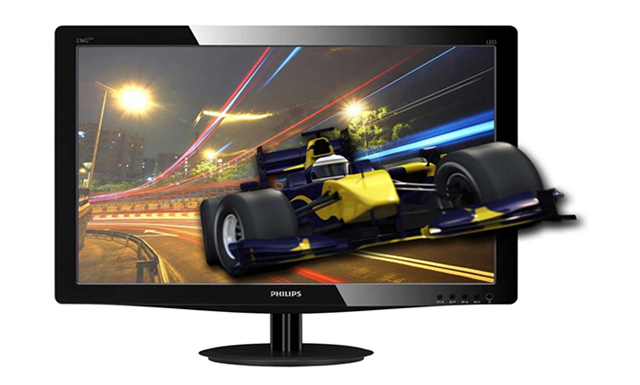 Philips 236G brings the 3d experience onto your desktop. Enjoy the pleasure of seeing even smallest details in the whole picture. This LCD monitor features a 23’’ diagonal at the resolution of 1920×1080 pixel quality. The screen type is TFT TN and is LED backlit. The glossy black case is sleek but unfortunately attracts fingerprints and dust easily. The mechanism of the stand gives you the mechanical freedom of leaning it 20 degrees backwards and 5 degrees forward. On the bottom right corner there are multiple controls for instant access to the main functions menu and a 3d to 2d instant switch. TriDef 3D sowftware will help you get the most our of the 3d experience on this monitor. There is a smart image key that offers 6 different modes: Office, Photo, Movie, Game and Economy where each one provides different settings according to the contents you are viewing. You can easily view two screen simultaneously and what is more you can easily align them as you wish. It is just a great desktop addition that not only provides perfect visual performance on a widescreen, but also delivers an ultimate 3d experience at home. Now you can enjoy your favorite 3d videos in the comfort of your own home. The brightness level is 250cd/m2 and the contrast ratio 1000:1.This monitor is big enough to enjoy also as a home theatre screen as it provides a comfortable wide 170-degree viewing angle. The 16.7 million colors are managed by the color calibration technology. It offers a true-life picture where every detail comes to life. On the backside of the case you will find 2 HDMI ports, a VGA input and a stereo audio output. This Philips 236G 3d monitor weighs 3.26kg. It is energy efficient and for its power consumption it receives an Energy Star 5 certificate. The monitor comes with a pair 3d glasses.